Shop the best tires in Scott Afb, IL at Firestone Complete Auto Care. We're the place to go for tire installation, mounting, balancing, repairs, and more! When you need new tires in Scott Afb, you need Firestone Complete Auto Care. Whether you drive a car, truck, minivan, or SUV, you'll find some of the best tire deals! 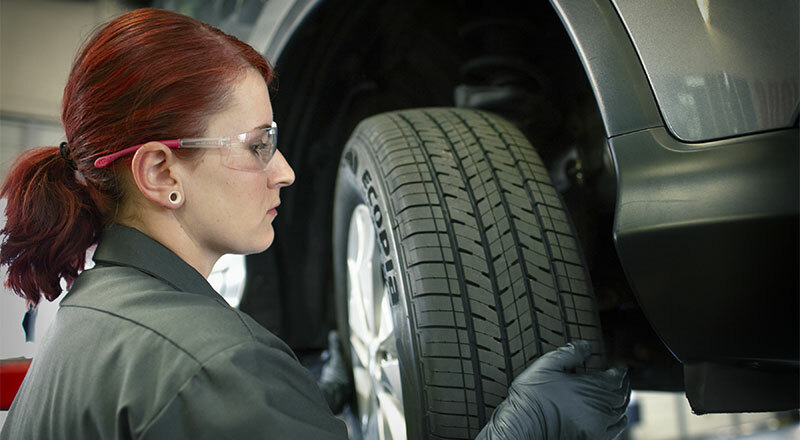 Our technicians will help you settle on the best tires for your budget, lifestyle, and climate. Explore our robust inventory online and shop tires from trusted brands like Bridgestone and Firestone. Then schedule your installation at a time that's convenient for you! From studded winter tires to slick sport tires, Firestone Complete Auto Care has what your vehicle needs. Not sure if your level of tire wear is safe? Our experienced technicians can help, but you can do a little research in your driveway too. First, check your current tires for tread wear. If the treads appear worn or shallow, your tires may not have enough grip to keep your vehicle on the road. And that's not safe! Keep an eye out for deep scrapes, bumps, bulges, or cracks in the sidewalls, and note the age of the tire. Your tread may look A-OK, but car manufacturers usually recommend getting new tires every six to ten years. It can be matter of staying safe on the road, something that's very important to us at Firestone Complete Auto Care in Scott Afb. Gear up for a once in a lifetime drive or a more eco-friendly drive to work with the right tires from your nearby tire place, Firestone Complete Auto Care. You'll get exactly what you need from the most trusted brands in the business, including Firestone, Bridgestone, and Primewell. Trust us with your tires and you'll enjoy more than just expert installation. We'll also provide you with courtesy pressure checks and tread inspections, as well as trustworthy tire patching and plugging, rotation, and alignment. We've been a top tire shop in Scott Afb for years, and one of America's leading tire companies for nearly a century. For quality service at spectacular prices, come to Firestone Complete Auto Care. Shop new tires online and book your installation appointment today! From drivetrain services to batteries to tire repair, trust your nearest Firestone Complete Auto Care for your car or truck maintenance and repairs. We're your local car care center, tire store, and automotive shop combined into one. Our automotive technicians work hard to help ensure that your vehicle runs the way it should. Bring your truck or car to us for maintenance and we promise affordable prices and exceptional service. Ready to experience the difference? Book your Scott Afb, Illinois auto repair or service today.